To see the two of us jumping around like children at 3am in the morning must mean something positive and significant happened to us. It was one of those moments that empowers us to keep pushing forwards even when we don't feel like it. As you all know we have been developing Skyline with the aim to be able to make releasable games quickly. Every now and then you get a glimpse of this power but then it's generally quashed with so many problems that we are thrown back into deep development awaiting the day we can attempt an idea again. Last week was thankfully not one of these times. 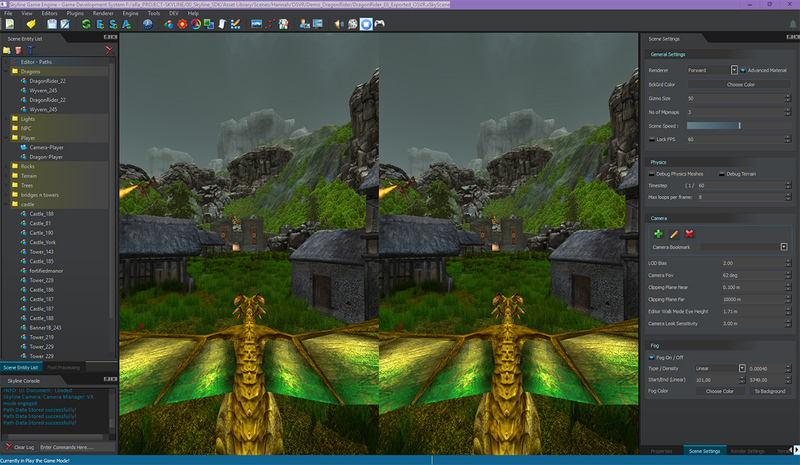 This quick journey was started five days ago on the back of the 0.9.7 release when we were asked to create a demo for the OSVR headset. we thought yeah we can do that, then we realized we only had a week left to finalise the OSVR Skyline integration and create a complete stand alone game package eek! The demo idea was broken down into five stages and we discussed what we could possibly achieve for each stage. We knew early on that our vision would have to be watered down a little and made into a realistic goal. These stages were then shoehorned into the week ahead but necessarily a stage per day as all tasks were juggled in between other jobs and we tackled only what was needed at that moment to keep the project moving forwards. Stage Two: Locate World Assets - This is a fantasy with dragons, so we definitely need Castles and these we purchased from the Arteria3D library. Also to make the world more fun to fly through we needed to find other assets such as rocks, trees etc. The rocks were courtesy of Manufactura K4 who provide us with some awesome rocks and other medieval assets. Stage Four: Engine fixes and feature requirements - As we were using Skyline intensely under pressure we instantly hit the bugs and issues from the new release, as many of you have also encountered. These problems were located and then resolved to keep us on track. On top of the demo code adjustments we had to integrate our test version of the OSVR sdk into Skyline and make it a simple work flow which has ended up being a VR check box on the camera entity, nice and simple. Dragon needed to follow a path. Camera needed to follow dragon with the ability to turn it off so we get a god's eye view of all of the paths. 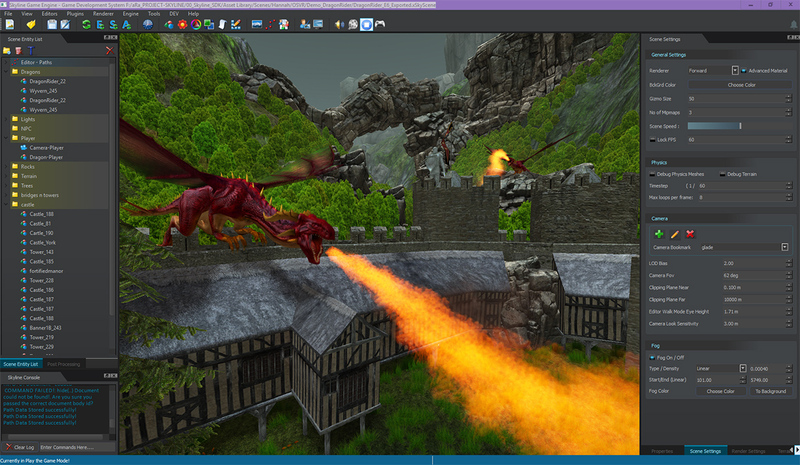 Dragon needs to spit out fire, for this we made many types of fire effects but they did not get into the early demo version. Now this task was made harder by the fact that the dragon's fire animation moved the head so the fire effect needed to be attached to a bone in the dragon's head so it moved with the animation. Fire to burn the castle, also didn't make it into early demo version. 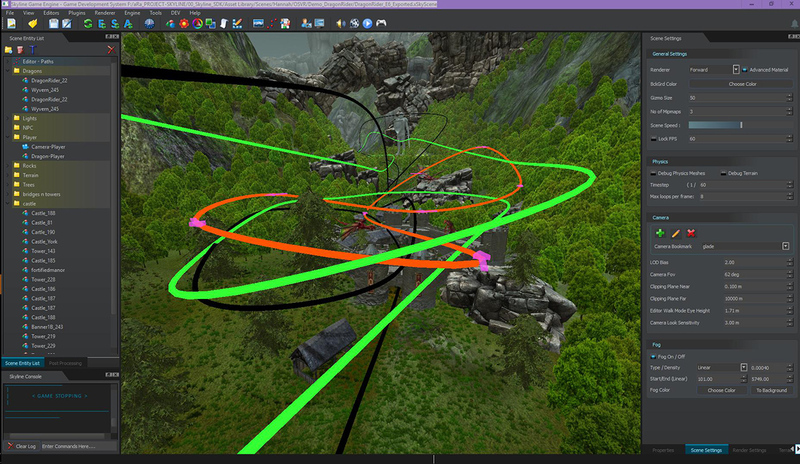 A lot of the above mechanics were made straight out of the box without any new code apart from the OSVR integration. We worked our ideas into what was realistically possible with time and the current build. The path system did need a new action to attach the dragon to the path and that was it! This new action plus OSVR was released in the 0.9.7.2 patch so you can all do easy flythroughs. We did advance the path system so that adding a node was as easy as moving the camera and pressing space key to add new nodes. As time was short we had to cut corners from the original vision so we could make the deadline. 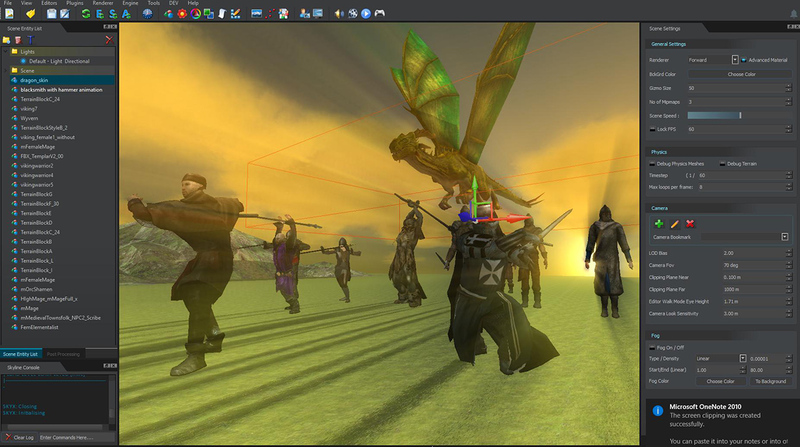 Skyline worked as we hoped and enabled a fast development of our demo. 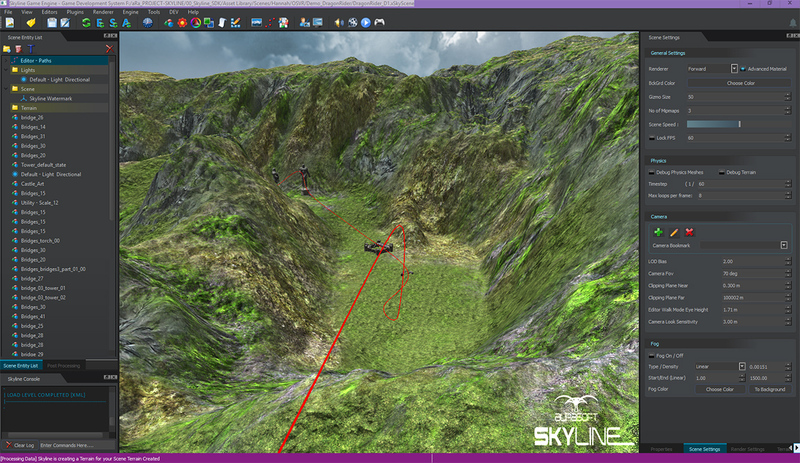 By doing this project we have surpassed one of our personal Skyline development milestones which was to conceive and create a project from start to a complete user installer game package all from within Skyline. This is why I started this post with our 3am jubilation. 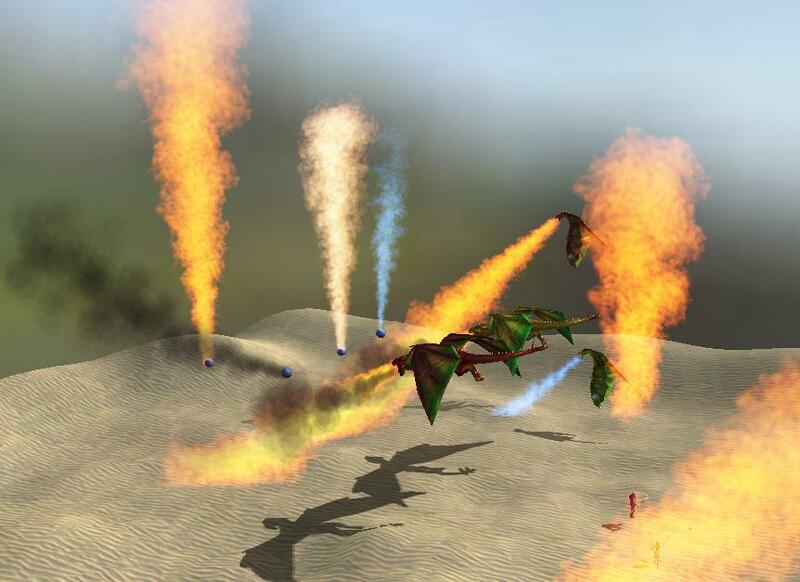 By working under pressure we have uncovered areas that need reinforcement and from this we can plan for the next set of features to be added and upgraded over the next few months so bigger more populated levels can be created and a full game can come from the ashes of the dragon's fire. 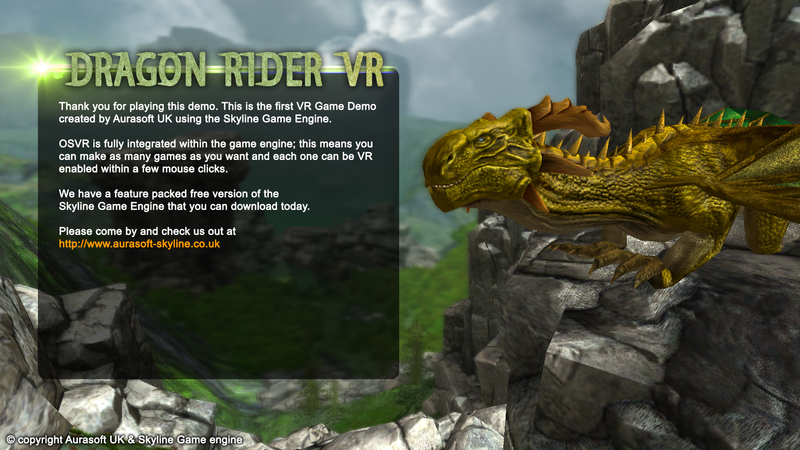 Watch this space for new more improved versions of our Dragon Rider VR.